Please read all details before submitting your request. If you would like to apply for sponsorship from Resene please complete this form and return to us as directed below. 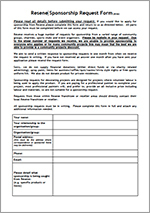 All parts of this form must be completed before we can assess your request. Resene receives a huge number of requests for sponsorship from a varied range of community groups, charities, sports clubs and event organisers. Please be realistic and patient with your request. We regularly receive over 50 requests a week and while we endeavour to assist where we can, we are unable to assist all projects. If you are seeking sponsorship, please bear in mind our staff are also busy helping our customers with their paint, colour and wallpaper needs so please be prepared to be patient. For many community projects this may mean that the best we are able to provide is a community projects discount. We aim to send a written response to sponsorship requests in one month from when we receive the request in writing. If you have not received an answer one month after you have sent your application please resend the request form. Sorry, we do not supply financial donations (either direct funds or via charity related advertising), spray paint, items for auctions/raffles/protests/quiz/casino/trivia style nights or free sports uniform/kit. We also do not donate product for private residences. Sponsorship requests for decorating projects are designed for projects where volunteer labour is being used to apply the product. If you are paying for a professional painter to complete your project, most professional painters will, and prefer to, provide an all inclusive price including labour and materials, so are not suitable for a sponsorship request. Requests from those within Resene franchisee or reseller areas should directly contact their local Resene franchisee or reseller. All sponsorship requests must be in writing. Please complete this form in full and attach any additional information needed. Please submit an answer to these questions as fully as possible. Note that all fields marked with red * must be filled in in order to send this form. Thank you. Additional details should be noted to clarify the request. We endeavour to respond to sponsorship requests within one month of receipt. If you have not received an answer within this time period please resend the request form.